5 lumbar (low back) segments. Since the Gonstead doctor wants to be as specific as possible in analysis and treatment, this information is vital in order to avoid adjusting the wrong segment when counting by palpation to the exact vertebral subluxation. All required measures are taken to insure the exposures are taken with the least amount of radiation via the use of high speed screens, collimation, gonadal shielding and automatic chemical processing. Your posture and its curves and how your body reacts to the forces of gravity. 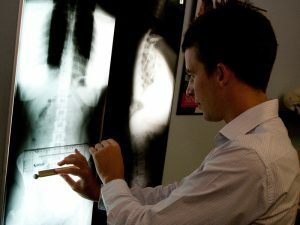 Taking into consideration all the x-ray findings, your chiropractor also takes into account your condition and examination and plans the specific adjustment required to correct your subluxation. X-rays are a form of energy similar to radio waves and sunshine. Commonly, they are used to view the bony structures of the body to rule out any pathology, and in particular to Chiropractors, a means of bio mechanical analysis. MRI (Magnetic Resonance Imaging) which use strong radio waves and magnets to create the picture. CT scans (Computerized Axial Tomography) is a 3D X-ray. These can provide more information on bone and soft tissue. These scans can be useful to your Chiropractor but do not provide all the same information that a full spine X-ray provides. The reason being that the spine is a weight bearing structure and hence needs to be analysed in such a manner. Your Gonstead Chiropractor will take a FULL SPINE X-ray in a weight bearing (standing) position to accurately visualize your spine’s condition. No. 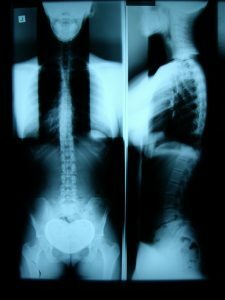 At Chiropractic Solutions we will only perform an x-ray if it is indicated. Pregnant women will not be X-rayed. PLEASE NOTIFY YOUR CHIROPRACTOR EVEN IF YOU SUSPECT YOU ARE PREGNANT.